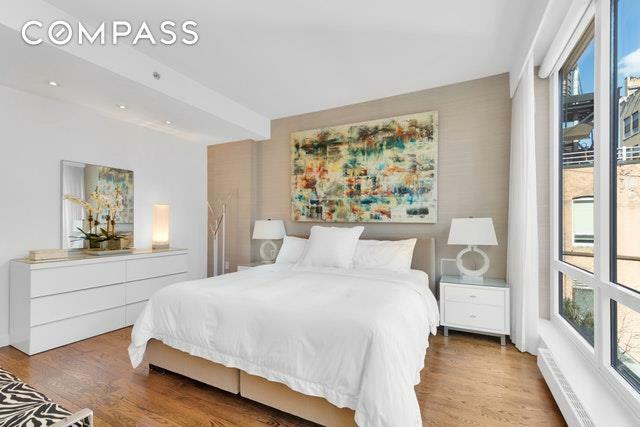 Rare opportunity to buy in one of the best boutique, full-service condos in prime Chelsea. This one-owner, mint condition, 2 bedroom, 2 bath home boasts a well-designed layout with open north facing views of the cityscape. 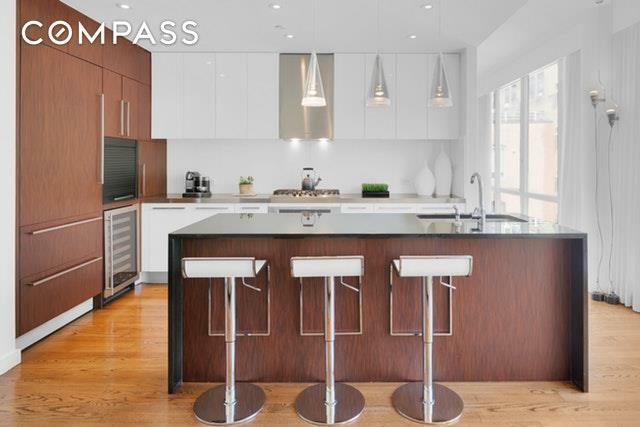 Framed by continuous floor-to-ceiling windows and 9.5 foot ceiling heights, the light-filled living spaces are finished in a modern aesthetic with solid oak hardwood floors throughout. The windowed, eat-in kitchen is outfitted with premium Sub-Zero and Bosch appliances, a Marvel wine cabinet, stainless steel and black lava counters, and Wenge wood cabinetry. Providing ultimate privacy, the two bedrooms with en suite baths are positioned on opposite wings of the residence. An oasis of tranquility, the spacious master bath features a double vanity, free-standing porcelain soaking tub, separate shower, radiant heated floors, built-in media, marble floors, and Tau Corten tile walls. Adding to the comfort and convenience, this home is equipped with electric shades, a Sonos/Crestron entertainment system, dual central air conditioning units controlled by Nest, and a Bosch in unit washer/dryer. 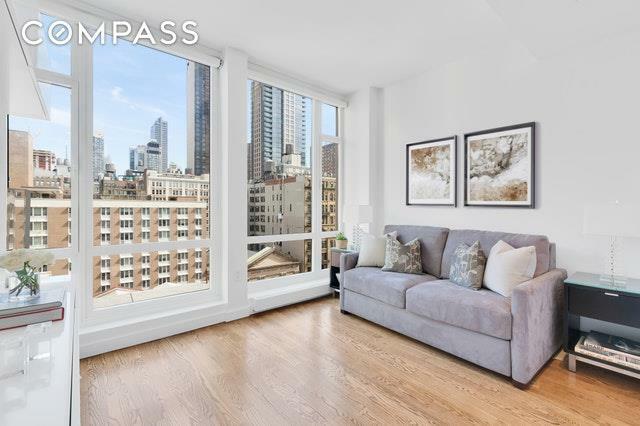 133 West 22nd Street is among the area's most sought-after condominiums conveniently located between Sixth and Seventh Avenues. Completed in 2008, this 12-story new construction building designed by Cetra-Rudy offers a full-time doorman, 24-hour concierge, live-in resident manager, outdoor swimming pool, private gym with saunas and showers, parking garage accessible from the basement, and stunning landscaped rooftop deck with dining and lounge areas, a wet bar and 2 grills. 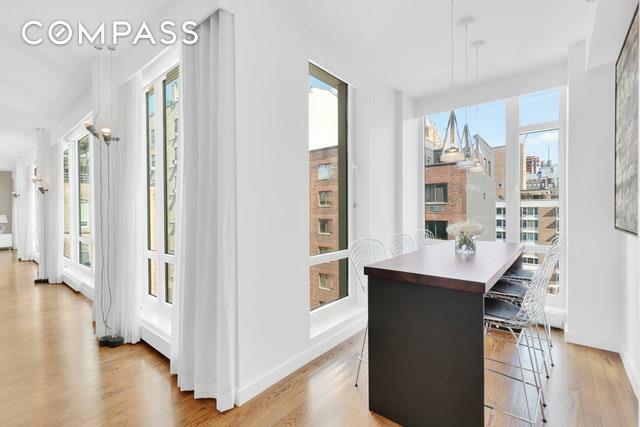 The location is exceptional, steps from art galleries, shops and restaurants, Eataly, Fairway, Trader Joe's, Whole Foods, Madison Square Park, West Village, Meatpacking District, the High Line, and the 23rd street subway and bus lines.Pied-a-terre, subletting, and pets allowed. Deeded storage unit available for separate sale.